Hope you all are very happy and enjoying your life! 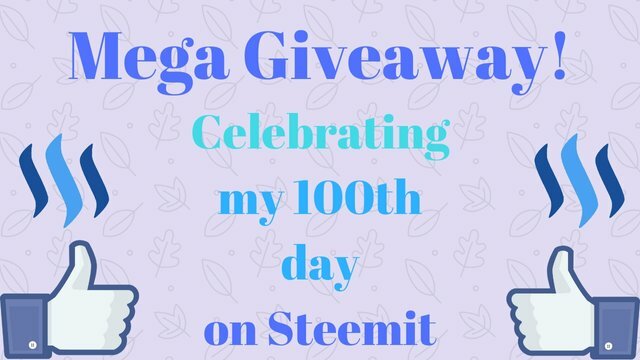 Today, I am very happy because today I have completed my 100 days on steemit platform. I joined on 15th September 2018 and from then my blogging journey has started. Steemit is a unique social media platform where you can earn money based on your skills. But not only that, you can find here amazing friends! Growing yourself in steemit is not an easy task in here but if you have dedication, patience and hard working mentality.. you can grow easily. Friends are very important in steemit. No matter how hard you try, you can not grow alone in here. The mantra is "Together we will grow!" Help your friends, support other's work and automatically they will support you back!! I also have met with some amazing wise minded people in here who helped me a lot to grow! I believe you have also friends in here and if you work together, success will kiss your foot one day! 4. In the comments tag 1 friend who should have to enter in the giveaway. If your friend has already invited by any other than it will not be valid. So, check other entries before tagging. 5. That's it. If you have done all the above, you are in the giveaway! First Prize: Winner will get 2 SBI shares, a rare Steem Monster card and 100% upvote from me! Second Prize: Winner will get 1 SBI share, a rare Steem Monster card and 100% upvote from me! Third Prize: Winner will get a rare Steem Monster card and 100% vote on his comment! Apart from these 3 winners, 2 more entries will receive my 100% vote! So, What are you waiting for? Grab your friends and win them all! Congratulations @atombot ! You received a 21% upvote from @kryptoniabot & @kryptonia for your task of 300 SUP Today. Congrats again, I've enjoyed getting to know you on here. @crypt-skip should enter this contest. U need to resteem and upvote to be eligible friend. I already upvoted. Thought I had resteemed it too, but it doesn't show in my feed, so guess I didn't. So now resteemed! Congratulations! Not joining the contest, but just dropping by to offer my support! Congratulations! I am so excited for you! We are close behind you. You have done some amazing things on this platform. So I think @enginewitty needs to enter. I know he is a crazed SteemIt Monster nut. Woo! Grats on the milestone! I just like the idea of "growing together" I think I'd like to tag a friend @the-tourist\nThis is it, isn't it? Congrats friend! You are really doing good. Congratulations! This post has been upvoted from the communal account, @minnowsupport, by mango-juice from the Minnow Support Project. It's a witness project run by aggroed, ausbitbank, teamsteem, someguy123, neoxian, followbtcnews, and netuoso. The goal is to help Steemit grow by supporting Minnows. Please find us at the Peace, Abundance, and Liberty Network (PALnet) Discord Channel. It's a completely public and open space to all members of the Steemit community who voluntarily choose to be there. Thanks for giveaway and congrats to your 💯 days. Thanks for giveaway and congratulations. You should join this contest!!! !